We are excited to announce that our longtime client and friends at Brushfire Records will release Jack Johnson and Friends - Best of Kokua Festival on April 17th. The album features a 13-track compilation of live performances from Jack Johnson’s Kokua Festival benefit concert for the Kokua Hawaii Foundation. Johnson will be joined by John Cruz and Paula Fuga for an intimate seven-date, all-acoustic tour of the beautiful Hawaiian Islands. The tour will be hitting Kauai, Oahu, Maui and the Big Island. Proceeds from Jack Johnson and Friends - Best of Kokua Festival and the tour will benefit the Kokua Hawaii Foundation which strives to provide students in Hawai’i with activities to enhance their appreciation and care for their enviroment. 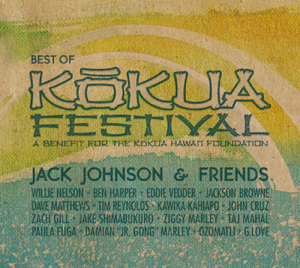 Jack Johnson and Friends - Best of Kokua Festival highlights the six amazing years of onstage collaborations with legendary musicians like Willie Nelson, Jackson Browne, Eddie Vedder, Ben Harper, Dave Mathews, Ziggy and Damian “Jr. Gong” Marley and more. Jack Johnson and Friends - Best of Kokua Festival live album will be released on April 17th and stay tuned for the Best of Kokua Festival online store! Click here for more info. An acoustic evening with Jack Johnson, John Cruz and Paula Fuga - Hawaiian Island Tour Dates Announced! Tickets On-Sale Saturday, March 3rd for ALL SHOWS at venue box office ONLY! Tickets go on sale Saturday, March 3rd at the venue box office. All tickets will be sold at the venue box office with a strict two ticket per person limit. Ticket Prices: $50, All Seats General Admission. Please Note: For this GA show ticket holders will receive a voucher at the time of purchase which is non-transferable. Be sure to bring your photo ID with you on the night of the show along with your voucher. You will not be admitted without both, and your entire group must enter at the same time. Ticket Prices: $75 Orchestra & Loge, $50 for Balcony (Plus $3 restoration fee), All Reserved Seats. Ticket Prices: $75, and $50. All Reserved Seats.